This isn't caused by wrong module paths, the code runs without error when started. Also, after I import the modules in a Python shell, autocomplete starts working as expected. Is there a solution for that or is this an architectural limitation for compiled extensions? Are there any other IDEs that manage to cope with this problem? For example, I use some third-party libraries which come as *.pyd files exclusively. Importing them into a Python console works fine (e.g. PythonWin), even Eclipse with PyDev reveals the internal structure of the modules and autocomplete works as expected. Has anyone made comparable observations with compiled extensions/modules?I'll try to set up a small example and provide the files tomorrow. I have attached two files and a few screenshot to document the behaviour. The library is compiled for Python 2.6 under Windows, I assume the Microsoft C/C++ runtimes are available on your system. In comparison, PythonWin (2.6.5) and Eclipse with PyDev (1.6.2) can reference the library and show autocompletion on the methods (see screenshots). I assume they simply do an "import myPythonLib" and then scan "dir(myPythonLib)"? After fiddling around with this problem, I think the explanation for the missing autocompletion can be boiled down to the behaviour described in http://devnet.jetbrains.net/message/5275169#5275169. 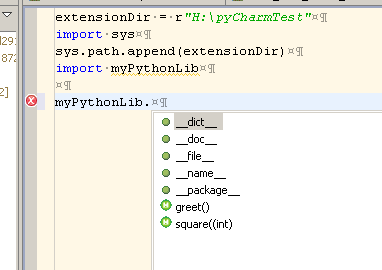 If I move the compiled extension to a standard path of my Python installation (e.g. Python26/lib/site-packages), skeletons are generated and autocompletion works as expected. I don't have the feeling that http://youtrack.jetbrains.net/issue/PY-2136 has really been resolved. Could you please check on that? If necessary, I can submit a new request. Thanks in advance. issue from PY-2136, so please file a new request in YouTrack. generated and autocompletion works as expected. http://youtrack.jetbrains.net/issue/PY-2136 has really been resolved. Thanks a lot for your confirmation. I filed a new request http://youtrack.jetbrains.net/issue/PY-3085. It's fixable, although a bit of a faf. >>>Remember to double click on teh exe, clicking Okay WILL NOT add your interpreter to the list.